Request your free quote now! Did someone say Edge Detail? What is water jet cutting? What type of equipment does Stone Center have? Stone Center has a Flow Mach 3 water jet with a dynamic head. The dynamic head allows us to cut faster with less taper than with a conventional water jet. This ultimately leads to more cost-effective cutting and better cutting of thick materials. What kind of file do I need to have for cutting? We can work with a variety of CAD files. We use Flow Master software, which is a special program for use with Flow water jets. However, we can easily import many types of CAD files including DXF, DWG, and IGS. Having a drawing ready to go in one of these formats saves us setup time, and saves you money. It also allows us to get you a quick and easy cost estimate. Help, I have a design I want cut but I don’t have a file. What do I do? Send us what you do have! We can import PDF files and drawings into CAD and convert them into a useable cutting file. If you have only pictures and ideas, bring them to us and through our design services we can work together to create a file to make just the thing you have in mind. What can you cut with a water jet? A better question would be “what can’t you cut?” Water jet machines can cut nearly any material including stone, metals, plastics, glass, foam, wood, and more. One thing we can’t cut is tempered glass because it’s made to shatter on impact and will shatter into pieces if we attempt to pierce it – that’s why it’s used in things like car windshields. What is the maximum size that Stone Center Inc can water jet cut? We are able to cut materials up to 6’5” x 13’ with thickness up to 6”. What precision can you cut to? The Flow Mach 3 can cut with precision up to +/- .0015″ per 3 feet. How does water jet cutting compare to laser cutting? Water jet cutting involves no heat, so it can be used to cut heat sensitive materials that might be damaged by laser cutting. There is no thermal distortion with water jetting. Water jetting can also be used on a wider range of materials including reflective materials, which lasers can’t cut. The Waterjet is not affected by a reflective surface, unlike lasers. Unlike lasers, which need a uniform surface to cut, water jet machines produce a consistent cutting power over uneven material. While lasers can only practically cut to about ½” thick, our water jet machine can cut up to 6” thick material, depending on the material. 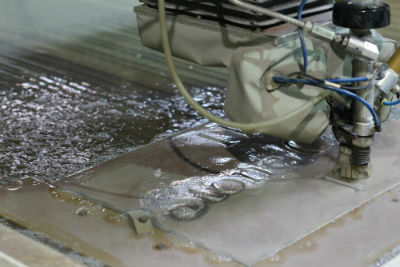 Water jet machines can cut more precisely on thicker material. Water jet cutting produces a smoother edge finish which results in less machining needed later. This saves you valuable time and money. How does water jet cutting compare to plasma cutting? Water jets can be used to cut many materials which plasma cutting cannot – such as materials that won’t melt (wood and stone), or materials that would be destroyed by melting (many plastics, aluminum). Plasma cutting is only practical for cutting metals. Waterjets can cut nearly any material. Water jets can cut more precisely than plasma cutters because no leftover melted metal remains along the cutting edge. How does water jet cutting compare to EDM? Water jets can cut much faster than EDM systems, while still maintaining accuracy up to +/- .0015″. EDM only works on conductive materials. Water jet machines will cut so much more including wood, stone, and glass! Unlike EDM, which needs a uniform surface to cut consistently, water jet machines produce a consistent cutting power over uneven material. EDM requires a pierce hole to be made before cutting can begin. Water jet machines can make their own pierce hole, saving time and set up costs. Our work table is much larger than the average EDM table which allows us to cut large pieces. If you’d like to know more, please contact us! The Stone Center went the extra mile fabricating two pieces for the shower that I did not think of until after the counters were complete. They are the best!